Is it back to business as usual, or is it business different and in some ways better than before? What are insiders saying? Trusting and collaborative relationships, doing more with less, sustainability, perseverance, and creative adaptability are themes weaving through many different fields and conversations these days. After a rough few years moving through a transitioning economy, strong teams involved in the world of design and build in the Flathead Valley have both kept the pace and continue to lead as they create a fresh and sustaining rhythm. As the housing market regains energy, many homeowners are choosing to either remodel their existing vacation or second homes, and often they downsize from multiple properties in favor of lower maintenance or build something new, inspired by new perspectives. Some of the large-scale projects are getting larger, but the trend of building “smaller, simpler, and smarter,” as we shared in our Summer/Fall 2012 issue, continues. In this discussion, we hear about the current tenor of the building and design industry in the Flathead Valley as its economy and the people who create it continue forward. Perspectives from Dave Radatti, Jason Pohlman, and Marty Beale of Mindful Designs; Scott Elden of Montana Creative Architecture + Design; Ole Netteberg of The Old World Cabinet Company; Len Ford of Ford Custom Homes; Casey Malmquist of Malmquist Construction; and Brad Reedstrom of Bigfork Builders remind us that it’s often the largest challenges that produce the best designs. What is the most noticeable difference in the tenor of the industry? Dave, Jason and Marty: For a short period, the banking industry and the public were both a bit paralyzed by the economic downturn and were reluctant to do much of anything. In the past year, the banking industry seems to have a more positive outlook on the immediate financial future and is therefore more open to lending on construction loans. Potential clients seem to have adjusted to the current economic conditions and to be ready to make financial moves once again. The increased confidence on the part of the banks and the consumers alike has spurred a spike in the local building activity. Scott: After those years of large speculative homes, the biggest shift is for the better: better quality, fit, systems, and a more appropriate home size. Many people ready to build a home are asking for a high quality, energy efficient, smaller, and cozier home. Making a return at resale is less important; making a home to live in is most important. Ole: We’re not seeing the 10,000-square-foot houses as much as we’re seeing interest in homes about half that size. 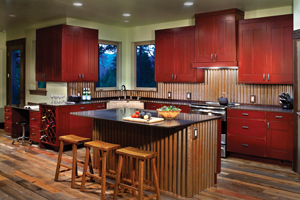 No matter the scale of the project, quality and details are still in demand for cabinetry. 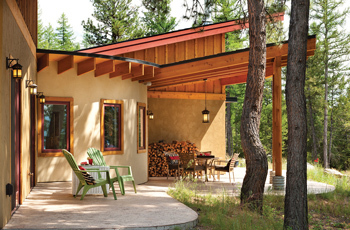 Probably the biggest change in style and detailing is that rustic elegance is giving way to mountain modern. We are really seeing a blend right now between the styles, and we are seeing more harmony, more function, and fewer “trophy” looks. Len: I do notice things starting to improve and move. Properties are selling, allowing more folks to move on from an older home and build new. Casey: There seems to be a lot of personal energy and passion behind the projects we are seeing now. There were a lot of speculative and investment type projects that fueled the run up a few years back. It is nice to feel that personal connection between the owner and their home again. Brad: We are definitely seeing an increase in building as the industry recovers. Growth in all of the building sectors is allowing many to get back to work doing what they really love to do. Who is your primary new client base? New builds or remodels? Local, regional, out-of-state? Dave, Jason and Marty: In this past year, we have seen a dramatic shift from an industry dominated by remodels, additions, and general home improvement projects to new construction projects. Some of our new builds are for out-of-state and often out-of-country (primarily Canadian) vacation homeowners, and others are for local individuals interested in building a quality personal residence. Scott: Our company’s base in terms of numbers of projects is an equal spread between residential remodels and new construction, commercial and municipal projects. We also see the annual anomaly project like a lookout, wine cellar, tree house, or castle renovation. We seem to attract—and like—these one-off projects and have begun to build a following for the one-of-a-kind. Ole: We’re seeing some Canadians, but more retiree relocations from other areas. People who bought and built homes six or seven years ago are now ready to use them more full-time and base their lives here. Len: We’re seeing more folks who are retiring and making their homes here more full-time rather than just using their properties as vacation getaways. We see a decent amount of Canadian influence. Brad: We have clients from all over the country, Canada, and from this region. Most of our projects historically have been around Flathead Lake. We’re seeing more homeowners who are younger executives, building second and vacation homes as they crave time away from the cities and what this area has to offer. Notice any changes in the way teams or firms compete or collaborate? Dave, Jason and Marty: Competition is still very tough. Customers were very aware over the past few years that job opportunities were scarce and that industry professionals would push themselves and their companies to the limits in order to capture the little amount of work that might be available. Consumers are still holding onto a lot of the same ideals, making sure that they are getting the absolute most out of their money. Successful companies today try to fit as much value as possible into their projects to try and meet these demands. It sounds obvious, but compared to ten years prior, it seems that consumers today are taking advantage of the still highly competitive market and pushing companies to stretch how much product they can actually squeeze into a given budget. Scott: It was “everyone in the lifeboat.” After the recession, we observed less competition as some firms just stopped. Those remaining, moreover, had a spirit of collaboration. Our new company is the result of two firms working together. I see help across disciplines for consulting and more project-sharing and referrals in general. Ole: Things got more collaborative when things were tough and some companies fractured. Now, even in those that made it through, there is a focus on working to rebuild strong teams. Len: I think that the field became more competitive through the downturn and remains so as the pace picks back up. Casey: I think there is a shared respect among those who have made it through the downturn. While competition is a natural part of the process, we’re all also part of one community that collaborates for forward motion. I think we’re all experiencing a little bit of the euphoria that comes from making it through something tough—it’s important to stay level-headed as we move forward. Have you changed your offerings or team structure to adapt? Dave, Jason and Marty: We continually analyze our business structure to offer as much value as we can in our jobs. We have never been entirely preoccupied with finish material selection, and instead focus on the long-term value of the structure and performance-related systems, such as heating and insulation. Our company is known for educating our clients and helping them make decisions that raise the bar on their home’s energy performance, occupant comfort, durability/longevity, design quality, and interior environmental health. The consumer interest in these categories is definitely rising, but the relative levels of awareness and interest is vastly different from client to client. We try to help people understand all of these very complex aspects of building homes and to help them make decisions as to where spending extra money can help them out in the long run: savings on utility bills, reduced maintenance, better re-sale potential and value, better interior comfort and air quality, and the like. There is no best way to go about making these decisions; they all are personal and unique to each homeowner. We try to bridge the gap between the consumer and the information-overloaded world. Scott: Making small projects profitable and efficient while remaining cost-effective for the clients has been a theme. One way to handle this has been to offer a concept phase prior to the larger task of construction documents. This allows the small-scale project owner to go only as far as need be to secure a builder, financing, or test assumptions. Another method has been limited involvement in larger project planning, deferring compensation to the construction phase. In this way, we have skin in the game and benefit as the project does. Ole: We provide per-room cost estimates in the budgeting and planning process now, rather than the lump sum for the whole house. People are really prioritizing now. We see folks ready to spend again, but they’re planning more for the long term. Brad: During the downturn, we saw an increase in remodeling projects with close to 50 percent of our business consisting of remodels for past clients or their friends. To stay moving, we really needed to focus our aim and get more competitive, which required most of all a team approach. That meant sitting with our contractors and suppliers and really working to make things more streamlined. The entire process has helped us to be a better builder. Lead times for supplies have tightened up considerably. The entire team needs to be far more proactive in the selection process. This ties in with planning well from the beginning. Convincing a homeowner to decide on lighting fixtures very early in the process can be challenging, but it is necessary because suppliers keep a lower inventory on hand. We adjust and fine-tune our construction schedule often to accommodate lead times. It all makes for a more streamlined process. Casey: We are a company that is driven by people, process, and production. No matter what the current environment looks like, we have always tried to focus on these fundamental elements. Of course we have adapted and will continue to do so, but we adapt within the boundaries of having the best people, the most efficient and current processes, and the most resourceful and effective production. Are you working with any new materials or tools? Dave, Jason and Marty: Improving our understanding of building science and working with energy modeling programs, as well as historic data on homes already built, help us learn where money can best be spent in order to have the greatest influence on energy conservation and home durability. In the past year, we have built highly efficient homes with double-stud walls filled with cellulose, as well as with Structural Insulated Panels (SIPs), neither of which are new products, nor are they quite mainstream. Scott: Our company began using Revit 3-D modeling years ago. All projects are a virtual build in a 3-D model from the start. Our engineers and design collaborators work with it, too, so all systems are seen in 3-D. This saves considerable time and cost for everyone. Using GoToMeeting, Dropbox, and Voxer have changed the way we share and collaborate dramatically. We use these tools daily. Ole: We’re seeing far more stone, glass, and smooth surfaces—the mountain modern look. The greys are taking over the browns in the color palette. Brad: In terms of heating, we are working with a system out of Germany by Daikin—an air-source heat pump that is very efficient and nearly equivalent to geothermal systems at a fraction of the cost. Clients are seeking low-maintenance properties more than ever as they really look at the overall operating costs of a home over time. And they’re looking at that up-front. That is a great thing. We also have seen a large increase in demand for smart wiring in home and the ability to control everything from the heat to the irrigation systems from a smart phone. Casey: There have been some amazing advances in sustainable and renewable energy systems that are now available to the residential customer. Coupled with some attractive tax incentives, we are seeing a growing and positive response to these systems. Are you receiving any new types of requests from clients? Len: We are seeing more demand for in-town lots and more middle-income folks who want to prepare for retirement and create energy-efficient, low-maintenance homes. We focus on durable construction and design, and this includes creating homes with ongoing healthy air quality and doing our part to educate clients on aspects of sustainable building as a valuable long-term investment. How is technology—the Internet, social media, and sites like Houzz—affecting your workflow or client base? Dave, Jason and Marty: In our market and local building environment, nothing can replace word-of-mouth. We try incredibly hard to give our clients every reason imaginable to brag about our company for us. Some of our projects have created a buzz on Houzz and have been featured in the “Editor’s Picks” on Houzz, as well as in Mountain Living and Country’s Best Cabins. Ole: We are communicating a lot more through emails with pictures of favorite looks and ideas. I love the word harmony; I want people to feel good with what we make. We are able to do this more effectively when we have a good visual of what a client is going for. Len: Some clients source things online, and we encourage buying as much locally as possible because it usually winds up saving time and resources in the long run. The Internet is great for research, but we most often find that our local relationships and products provide the greatest long-term value. Brad: Clients love these sites for ideas. It is very helpful when a client shares ideas and photos of what they want. This kind of communication makes the design and build process far more efficient, enjoyable, and successful. Casey: Technology has made communication with our customers much more fluid and dynamic. The whole process and the communication of that process can virtually happen in real time. As many of our customers are building from a distance, this helps to bridge that distance gap and keeps our customers more involved. In regards to marketing and social exposure, we continue to rely on the tried and true standard of “word of mouth” marketing. There is no one better suited to promote our company and our people than our last satisfied homeowner. Dave, Jason and Marty: Pushing the limits on residential architecture, while keeping in mind progressively high standards of home performance—either one of these on its own is a reasonable task—but finding the sweet spot where both of these elements shine is a wonderful challenge, and it is one our company is well suited to meet. Ole: We love what we do. We’re happy to get busy again and doing more of what we love. Brad: One of my favorite things is the increase in interest in creating outdoor living spaces—not only living areas but also kitchen spaces. This means we can build a smaller footprint home, while at the same time creating a large living environment for the client. We see far more requests for natural landscaping and vegetation, including the existing site materials like rocks, vegetation, and logs. 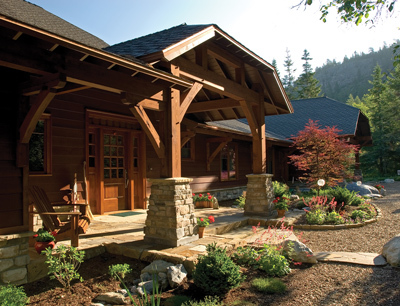 When a project is complete, this helps the home truly fit within its surroundings. Overall, we are seeing the theme of “less is more.” We still see a preference for high quality but in less quantity and requiring very little maintenance. There is far more of a focus on how a home makes the residents feel: lighter interior colors, more natural light incorporated, and modern design. We also are seeing an increase in flex spaces within a home. People are getting creative and thinking of how to use spaces for multiple purposes, which also lends itself to a smaller footprint and a cozier home. Working with smaller spaces brings out everyone’s creativity and challenges the design team in good ways. Casey: I’m interested in where the energy market is going, and how that affects all of us. We witnessed a large wave of greed and unrealistic expectations that ultimately drove the downturn, and it seems we’re all recovering from that slowly but surely. It’s about managing expectations and having healthy boundaries that ultimately help create sustainability and provide a far stronger business model. Brad: We have worked with local suppliers for years and trust them in their trade. It is incredibly valuable to be able for everyone on the team, including the client, to work personally with someone who really knows flooring, plumbing finishes, or lighting. There are always details in the design of any product that may not be evident when shopping online, and the expertise earned by the local specialists over time is very valuable. Scott: We are beginning to see a shift in the number of diverse “super projects.” These seem to represent some the most financially wealthy who are investing in special properties and vast projects. While the last ten years saw quasi-speculative upper-end projects, such as Whitefish Hills or Iron Horse where the focus was on high-end luxury properties and homes, these emerging new projects are on an entirely different scale and seem to redefine “high end.” This hint is still not confirmed enough to be called a trend, yet it’s what we are just beginning to see and to serve as a company. At the same time, the very basic homes, 1,500 to 4,000 square-foot home projects, are more busy and popular than ever. The highest-level global estates and the most humble requests are on the screen at the same time. We develop collaborative community affordable housing projects while working on fabulous private resort estate properties. This seems to reflect the distribution of wealth trends that we see across the board. Adapting to both and serving them well is a little like reaching out both arms in opposite directions. However, the design, materials, trades, and systems learned or used with one scale of project always inform the other. Each is equally challenging in its own ways. Everyone wants to have comfort and a sense of home, no matter the scale. Too little or too large a budget compromise these fundamental qualities equally, and our task is to embed these basic livable comforts into the project, no matter the budget or scale.